This is a classic. We get it all the time. For almost everyone, solar pays for itself handsomely, batteries do not - yet. Yes - even if you hardly use any electricity during the day. This is because solar panels are cheaper than they've ever been and Feed In Tariffs have recently increased substantially. The questioner in this particular case lives in postcode 3030. Werribee in western Melbourne. A quick look at my Feed In Tariff comparison tool shows me that a typical Feed In Tariff in that area is 12c per kWh. That means even though you'll be exporting most of your energy, you can get 12c for every kWh. Let's assume you export 90% of your solar (I assume you have some standby loads running during the day - and if you put your dishwashers and clothes washers on their built in timers you can use even more during the day). If you buy a 6.6kW system with a 5kW inverter (the best value-per-kW size at the moment), you might pay $7,000 for a very good system. That will generate about 3.6kWh per day per kW installed in Melbourne. That works out at 24kWh per day averaged over the year. If you export 90%, or 21.6kWh per day, you'll earn $0.12 x 21.6 = $2.60 per day from exports. Your self consumption of 2.4kWh per day will save you $0.25 x 2.4 = $0.6 per day. So you'll save $1,168 in your first year. That's a simple payback of 6 years. Even faster if electricity prices rise, which you know they almost certainly will. The more solar you self consume the bigger the savings are. So if you set your heating/cooling to pre-cool or pre-heat your home before you get back from work and use energy during the day at weekends, these savings will only get better and better. 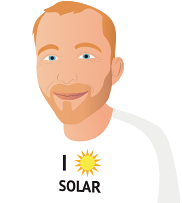 The questioner has been offered a 3.4kW solar system and battery for $5,800. At this low price I'm guessing he's been offered a tiny 1.2kWh Enphase AC battery that will save him 13c per kWh stored. Why 13c? Because any energy put into the battery is not being exported for the 12c feed in tariff. So you are not saving 25c per kWh (the cost of electricity in Vic) but 25-12c = 13c per kWh. In one year you'll save $0.13 1.2kWh x 365 = about $60 per year with the battery. That battery has added about $2,000 onto the price of the system. The payback on that $2,000 is 33 years. The battery is warranted for 10 years. Trust me, you don't need that battery. Get a bigger solar system instead. With a 12c feed in tariff you actually get a better return on a 6.6kW system, than anything smaller because you can get such a good price per kW at that size, due to the way the rebate works. Article is definitely useful. I think however there is one minor typo in your calculation ( don't want to sound picky as well ). With your Solar calculations, self consumption I think should be calculated at 2.4 KWH ( Total 24 = 21.6 + 2.4 ) rather than 2.6KWH.